This week's Intuitive Tuesday card was the Five of Swords (reversed), which signifies the aftermath of a disagreement, a competitive situation or some type of conflict in your life. This was so good for me to read today. I immediately thought of my divorce, which should be finalized literally any day now. What you said here: "This means that you have faced the forces of change by simply allowing, you've walked away from an argument or no longer have "winning" as your highest goal, and may be shedding the people and situations around you that are causing conflict." --this really made me think of the mediation I had to go to and the attitude with which I went. I loved the phrase, "getting hit by the divorce bus." I remember "getting hit" myself. I am currently writing a story about my own divorce that I plan to share with the Wild Women readers (hopefully soon), because right after the divorce bus hit, I began to hear my intuitive voice...which has since become a HUGE part of who I am and how I live my life. The card I pulled today for Quiet Dreams and for all of us is The Star card, which I pulled out of the Rider-Waite tarot deck (designed by Pamela Colman Smith under the direction of Arthur Edward Waite). I keep the mini-deck in the car with me so I can pull a card any time. 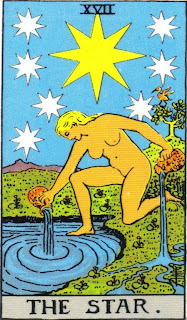 The Star is a card of hope, inspiration, optimism, harmony and luck. It encourages you to continue on your path and follow your dreams. Every time I pull this card, I know that no matter what's going on around me, things will be OK. The Star symbolizes positive energy flowing into your life, bringing you inspiration, exciting opportunities, guidance and renewal. Quiet Dreams, I sense that you are experiencing a renewal in many areas of your life. From your blog and your comment above, I know that you have recently moved, are going through the steps of mediation and divorce, and have a great companion, Miss. Famous. All of these are outward signs of renewal. The renewal indicated with The Star card is one of re-discovering who you REALLY are, dropping any facades or roles that you have been filling and carefully shedding the parts of you that now seem "fake" or "put on." It's not that you were intentionally doing this to fool people (even though at times you may have even fooled yourself -- temporarily), it was more a function of upbringing, old beliefs and survival. Think of The Star as a guiding force in your life, out in front of you showing you the way. Now is a time to tune into your intuition and inner wisdom and find the guidance you seek, especially when things get rough (Five of Swords). Through this process you will begin to know yourself better, day-by-day. The message for all of us is that even when times are tough, we each have a star out in front of us that serves as a reminder to continue on our path, follow the light (even though it may be dim at times) and keep moving forward on our journeys. When I was going through divorce, I used The Sun card as my guiding force. I bought a necklace that had a sun on it and everyone in my family knew and knows that I like The Sun. Just last weekend, my dad gave me a beautiful silver and copper sun (1 1/2 feet in diameter) to hang in my office. If you need some support, some guidance or a reminder that things will be OK, find a picture of a Moon, Sun, or whatever symbol will help you to keep moving forward. Hang it where you will see it regularly, or find a way to wear it, or take a picture and have it as your screen-saver. Be creative and find a way to remind yourself that things are and will be OK. Remember, the stars are always out there whether you can see them (night time) or not (day time). Sometimes it just takes a little reminding, patience and faith. Ahhhh....the Star card! Possibly my most favorite...being a Sag, the card of Hope resonates deeply. Thank you, Sheri. This: "The renewal indicated with The Star card is one of re-discovering who you REALLY are, dropping any facades or roles that you have been filling and carefully shedding the parts of you that now seem "fake" or "put on." It's not that you were intentionally doing this to fool people (even though at times you may have even fooled yourself -- temporarily), it was more a function of upbringing, old beliefs and survival." Definitely. In the house I grew up in, there were very strict ideas about what it meant to be "good." I have been learning to expand my definitions for a while now and learn that those "survival" days are over. Thank you for this. I really don't have words enough. What a wonderful card. And what you said about it -- "Every time I pull this card, I know that no matter what's going on around me, things will be OK" -- will stay with me. Whenever I notice a sun, I will remember that in the scheme of things, things are OK.
FWIW, I commented something similar on QD's blog yesterday. I think her current sickness is actually auspicious, part of her self-actualizing. Bravo, QD. The paragraph that Quiet Dreams quoted could have been written for me, and her response to it could have been spoken by me. I think the 5 of swords reversed definitely speaks to the fact of the decision made, and my husband on board with it--we're going to get a divorce and have it completed in 2010. This is an odd period, to be in this latency, between having made the decision and having it implemented. The Star is very reassuring to see. Funny, it reminded me of a dream last night I'd forgotten--where I could clearly see some beautiful stars in a twilight sky, which faded, but I knew they were still there. Hope, renewal, energy: sounds good to me! I'll take it. I've definitely been dropping my facade, too. Good card. Hope. I hope there is hope. Something has happened to me in the last couple of years that I have been unable to shake i.e. A lack of hope. A lack of Joy. I have become the epitome of pessimism and cynicism. Awareness of this doesn't seem to activate any movement out of it. When I ask myself what do you enjoy? (I really want the answer to that question because as soon as I identify it I will "do it" "be it" move towards "it") But there is nothing but silence when I ask. The silence is deafening! My adult daughter just moved in with me as neither one of us can financially support ourselves alone right now and she confided that she doesn't recognize me because I have become so negative. That breaks my heart. I see what she sees and I agree and yet seem powerless to move out of it! It's almost as if I want everyone to know...that I am not the "strong one" anymore. I am beat up and was told yesterday (at a Work Force seminar for "experienced workers" that I am now officially a "senior citizen". It feels like a death sentence! I love this card! I love the idea of a symbol that reminds you everything will be okay and keep moving forward. I'm not surprised you like the sun.. you are such a sunny person. It fits perfectly. You've inspired me to find a symbol that will remind me also. I would love to read your book. I can't wait.